100 beaches on the Amalfi coast, from Vietri sul Mare to Positano, can be viewed in this video. here. Visit their Facebook Site, with regularly updated news on the Beach, the Coast and picture collections captivating all the different shades of blue of the sea. 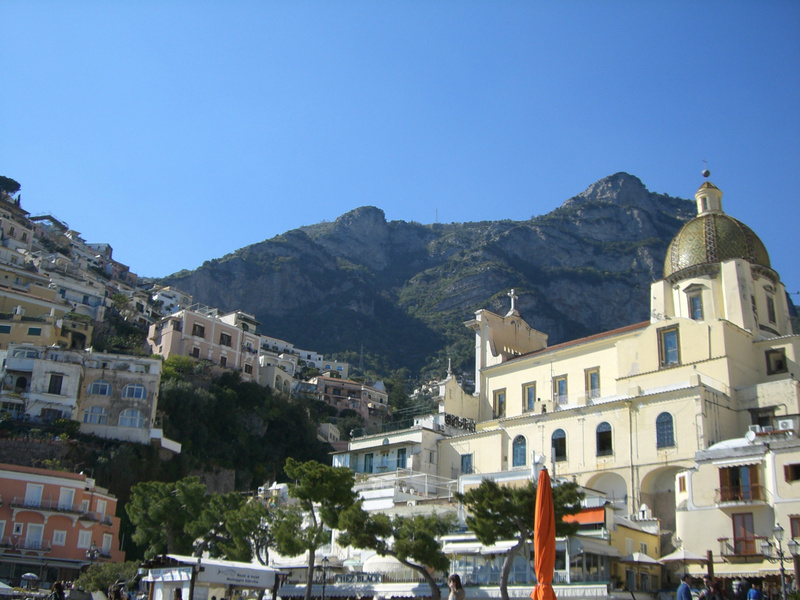 Click on the picture below to start a five pictures to get a round view of how the Positano Beach Marina Grande is settled into its cove. Wait five seconds for the next picture to appear automatically. Grey and black pebbles - guess it is a lava beach. 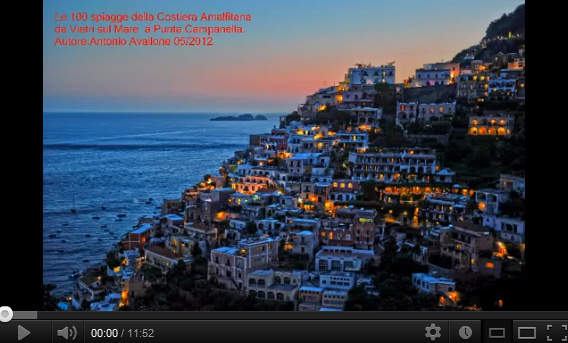 Click here for a Video to get an impression of the sights and sounds of waves all over. 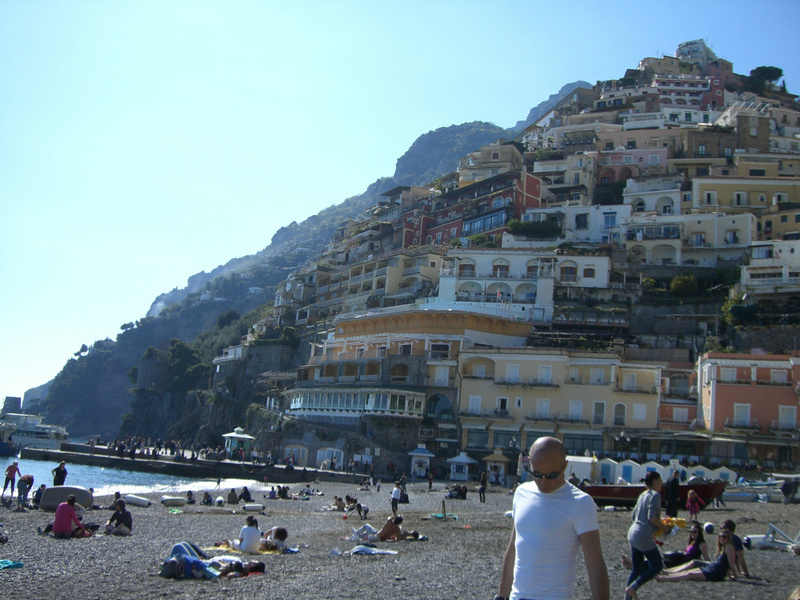 By the way - this was taken in April, but Positano's beach is protected from the winds by the Monto Lattari mountain ridge, so the sun gets the chance to really bake the beach. 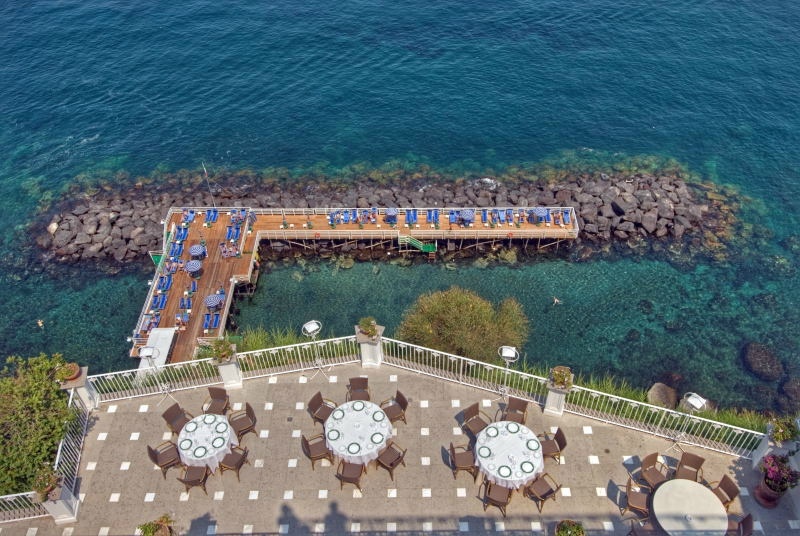 Sorrento beach blossoms: Hotels on the Sorrento waterfront usually have elevators to enable their guests to reach their private beaches on the bottom of the tufa stone plateau. 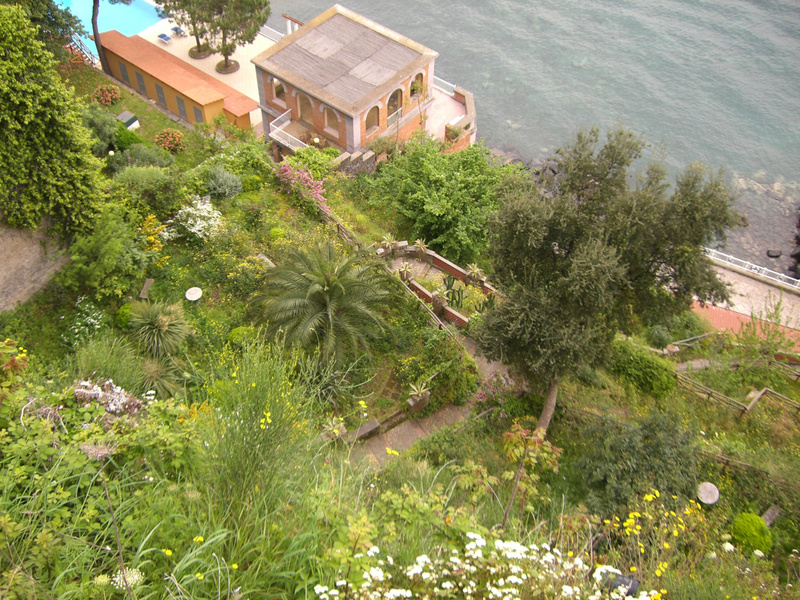 But in some hotels you can also walk down a steep path, surrounded by a garden full of white, yellow and violet wild flowers, junipers, olives and the yellow blossoms of goarse. 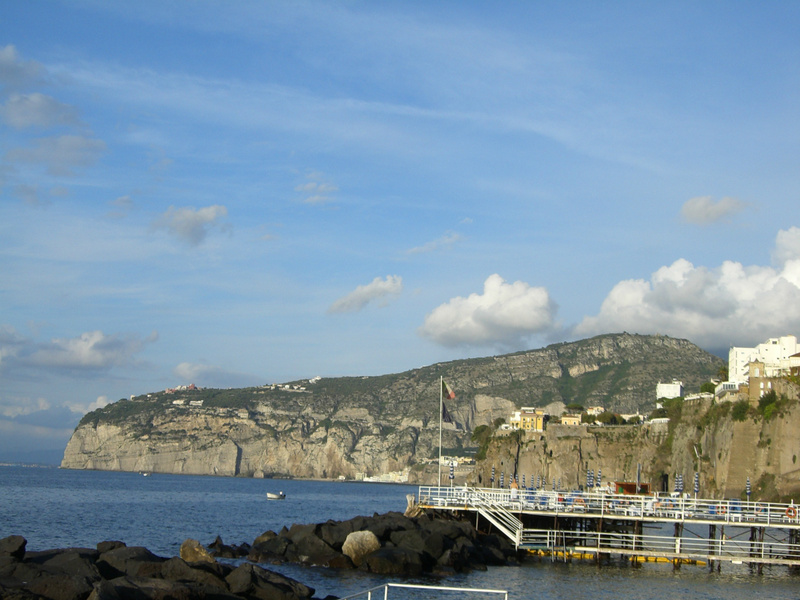 By following this link Sorrento Marina Grande View you will see a 360-degree picture taken directly from the rock barriers protecting Marina Grande. 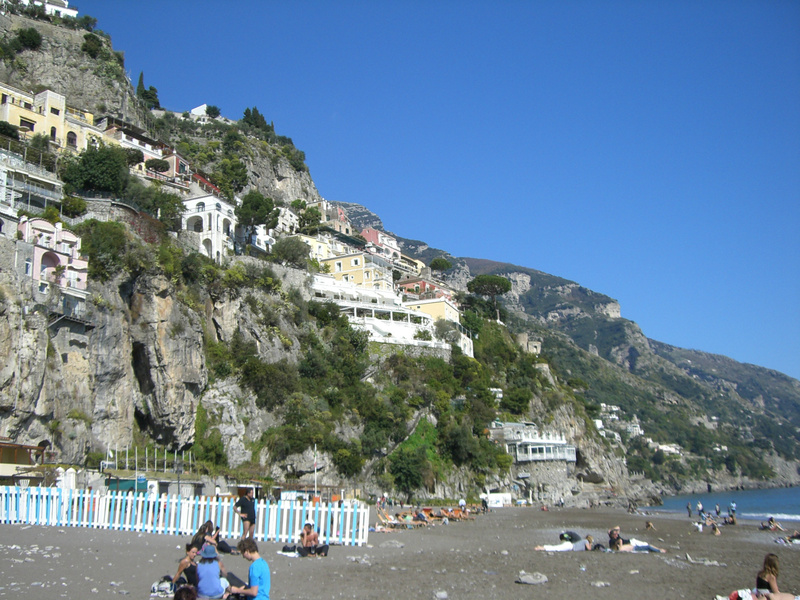 Compared to Marina Piccola and the beaches on the other side of Sorrento, the rocks here are of a lighter greyish shade. 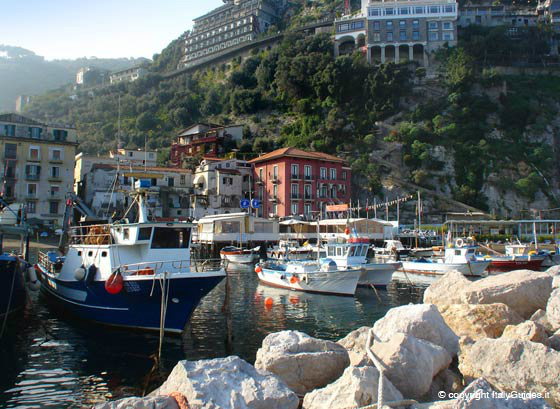 Marina Grande is the harbor where the small fishing boats come in. Here you have got a detailed view of the Gran Hotel Riviera's Beach, day and night. The picture is updated every five minutes, and you can see the waves ruffling towards the shore. 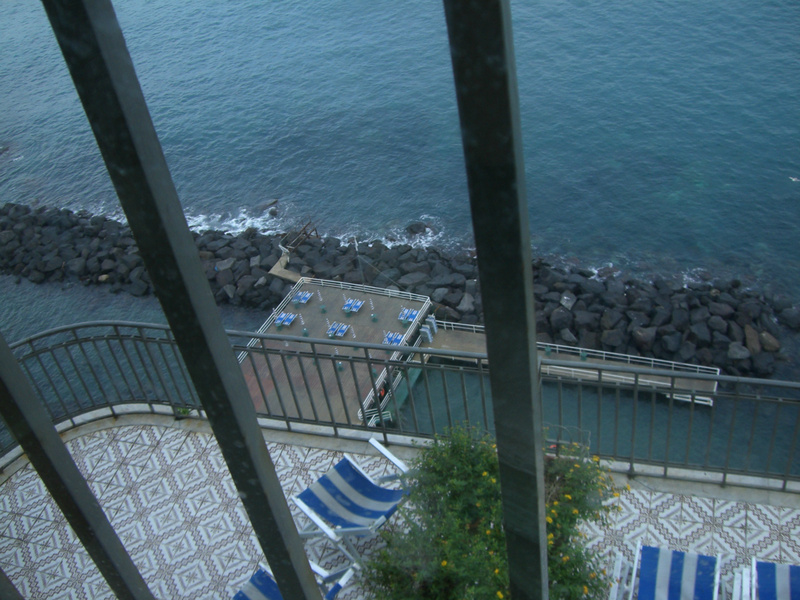 Again, it is those black lava rocks forming pools at the shore where hotel guests can safely take a swim. 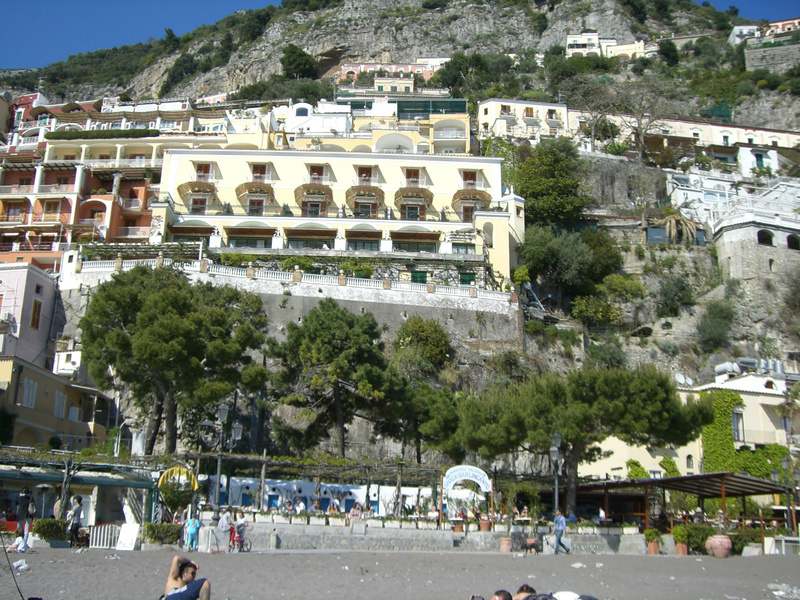 Read more about this Sorrento four-star hotel situated on Via Califano just above the shore here. 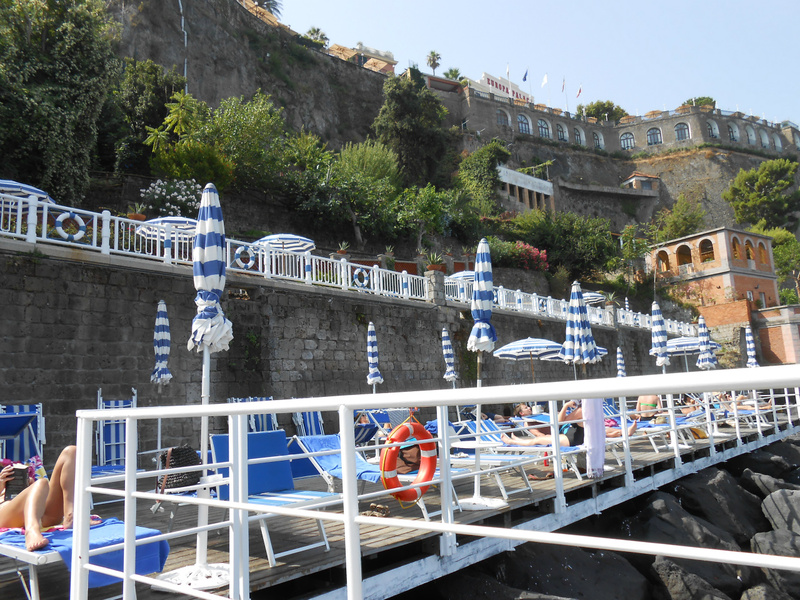 A close-up view of the rock barriers forming pools just off the tiny Sorrento beaches: Black lava rock beach at Hotel Ambasciatori. This beach can be reached via an elevator from the hotel lobby, and after a few steps along a humid tufa stone gallery a wooden pier with white railings opens up in front of you, leading towards the rock barriers. I am starting the beach collection with the view down on a typical Sorrento beach. Actually it is cliffs and cliff barriers set there artificially, and wooden piers where the deckchairs are placed. 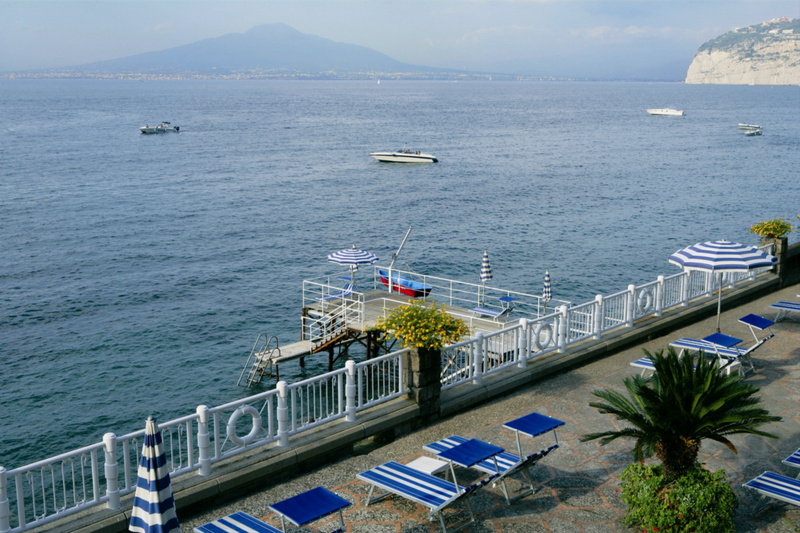 This is a picture taken down from Sorrento's Hotel Ambasciatori on their private beach, consisting of the pier and the black and grey colored rocks. Traumhafte Buchten mit Stränden aus Kieselsteinen, oft gemischt mit Lavasteinchen gehören dazu. Die Halbinsel Sorrent ist von diesen Stränden umsäumt. Meistens handelt es sich um kleine Buchten, von denen manche nur mit dem Boot erreichbar sind. Viele sind so gross, dass sich dort Trattorie und Lounges angesiedelt haben. Viele Buchten hat man aber nur für sich. Schauen Sie rein in diesen "Strandblog": Jede Woche werden neue Buchten und Strände vorgestellt, von Sorrent über Massalubrense, der Amalfiküste und natürlich auf Capri. 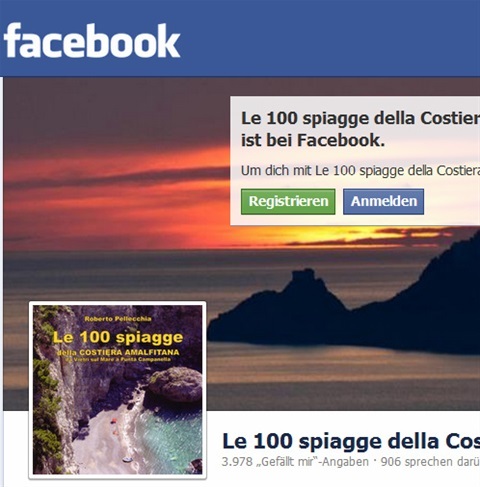 Es gibt auch ein empfehlenswertes Buch über "100 Strände der Costiera Amalfitana" von Roberto Pellecchia (italienisch und englisch). Dreamlike bays, coves and beaches of grey and black lava pebbles: the Sorrento Peninsula is lined with a host of tiny beaches that often can only be reached by boat. 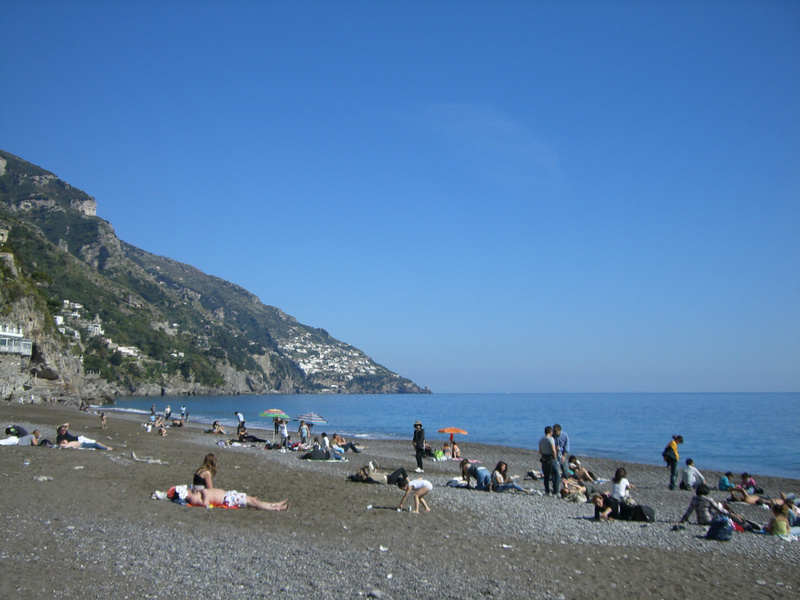 Some beaches are large enough for tiny trattorie to have lunch on the beach. But many beaches are just big enough for a picnic. 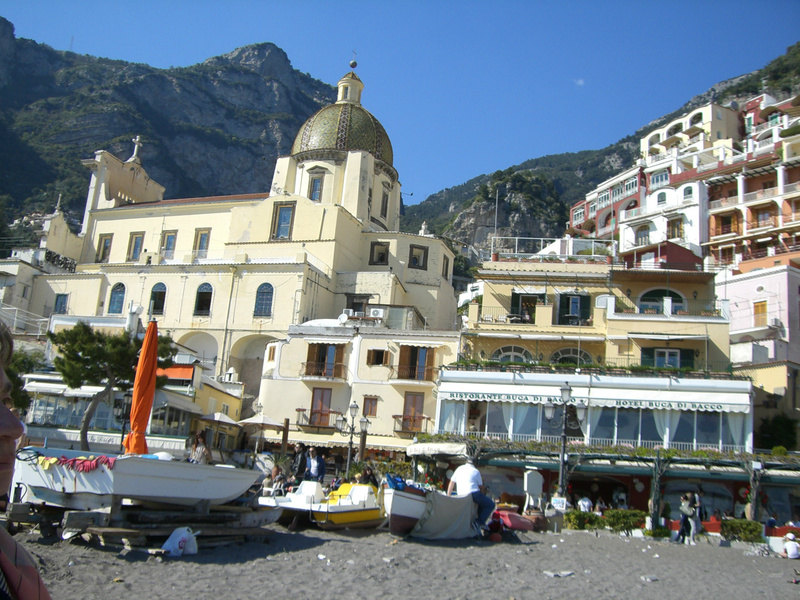 Look in here every week as the "Beach Blog" develops and new beaches will be presented, from Sorrento and Massalubrense to the Amalfi coast and on Capri. 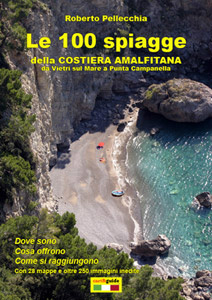 Many beaches are also beautifully described and illustrated in the Book "Le 100 spiagge della Costiera Amalfitana" by Roberto Pellechia (Italian and English versions).